On the city side of the hill behind Pitti Palace there is the wide garden of Boboli, done by will of Cosimo I de' Medici starting from 1549 and following the project by architect and sculptor Niccolò Pericoli called Il Tribolo; after him the building works were directed by Ammannati and then Buontalenti.The garden was intended to act as an appropriate scenery to the exclusive parties and governmental receptions by Medici's Court: it consists of a plentiful ensemble of greenery and architectural works. The entrance is at the end of the inner court of Pitti Palace and consists of a large stairway leading to a wide square with the Fontana del Carciofo (Artichoke Fountain). In the center of the garden there is the amphitheatre, where were once played dramas and comedies in a classical manner for the Court's guests. During the XIX century, when was fully lost the dramatic function, it increased its scenographical function with the installation of a marble fountain belonging to the Roman Age and an Egyptian obelisk. 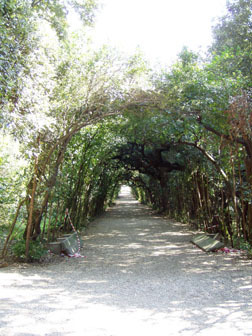 The Medici’s Florentine villa, now one of the world’s most august galleries, has a famous garden. 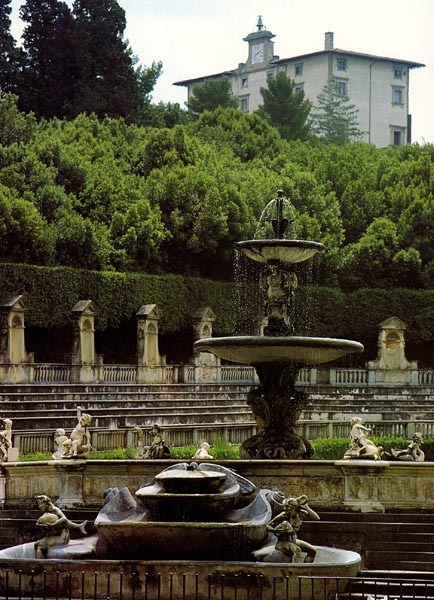 The original 1549 garden, designed by the sculptor, Tribolo, was similar to his work at Villa Castello. His clients were Duke Cosimo I and his strict, demanding, arrogant, but loyal Spanish wife, Eleonora of Toledo. The renaissance design was as regular as it could be on an undulating site. During the century after its inception, the garden changed and developed with help from many prominent designers. 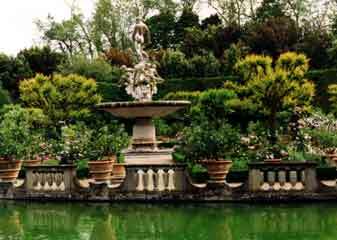 It became Florence’s grandest garden, with an early baroque drama and some avenues. This suited the theatrical events which were held. The great grotto, designed by Buontalenti, is near the Palace and contains Giambologna’s Venus and Michaelangelo’s four Slaves. There used to be water tricks and games. The natural amphitheatre behind the Pitti Palace was made into a real amphitheatre after 1600 and continues to be for plays.